The Flint Children’s Museum is preparing for their annual Back-To-School Grand Re-Opening on Tuesday, September 18th. This fall, young guests will get to experience two brand new exhibits, as well as enhanced current exhibits, and new and exciting programming. 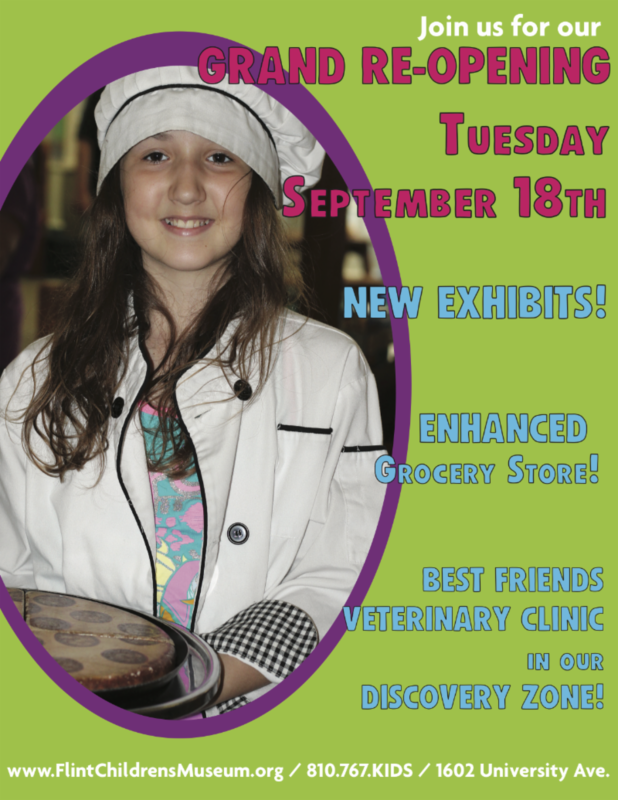 New exhibits include Best Friends Veterinary Clinic, where children learn about animal care, different kinds of pets, and pretend to be a veterinarian, pet groomer, or just play with all the pretend animals in the exhibit. Also new for fall is an enormous Light Bright wall, where kids can make colorful pictures and patterns with multi-colored pegs. They will also have an enhanced Smart Mart grocery store, the Big Blue Blocks on permanent display, and more. During the third week of the month of September, children can go outside and paint in the style of Van Gogh’s “Sunflowers” using thick “impasto” paint and stiff brushes and craft sticks. Van Gogh’s “Starry Night” is the inspiration during the last week of September. Children can observe a copy of the painting, and have fun painting on dark paper, mimicking the style Van Gogh used in the famous painting. October brings an abundance of fall activities as well as some “spooky science” fun! For field trips, we are offering some new activities designed to meet the science standards in a fun, exciting way! Field trip programs include the Science of Sound, Reflections on Light, Make it Rain, and the always popular Slime! To schedule a school field trip, or for more information, call 810-767-KIDS (4937), find them at flintchildrensmuseum.org, or email at discovery@flintchildrensmuseum.org. The Flint Children’s Museum is a non-profit organization dedicated to inspiring lifelong learning through hands-on play for children ages 2-10. Located at 1602 University Ave. Flint, MI 48504, general admission to the Museum is $6 per person. For more information, find them online at flintchildrensmuseum.org or contact them at 810-767-KIDS (5437).